But our top-heavy New Delhi decision-makers thinks otherwise! National Advisory Council (NAC)’s ideas rejected by the rural development ministry, food ministry and others. NAC is National Food Security Bill (NFSB) is facing resistance from various administrative ministries. With no idea of entrusting the jobs scheme to monitoring by panchayats and social audit by villagers and also ensuring subsidized food to poor families, there are on-going debates by all and sundry who have no legal authority to do what they are now doing. There are various groups of do-gooders, busy bodies and others who adorn NAC, Planning Commission, and various PM’s advisory councils. The result is the present chaos, the scams and drift in governance. NAC has acquired a special mystique and much incoherence at the same time. What is it doing? What are its new schemes? Simply because Sonia Gandhi heads it and as Sonia Gandhi is seen as the power behind the throne or the plain PM chair, it is because of this political conundrum, we see some skewed views about our own ideas of what constitutes development. Are there many persons these days, who believe what the Prime Minister says about economic reforms? Very few and that too for the sake of form. There are too many busybodies in the corridors of power in New Delhi. There are armies of members of the NAC, the Planning Commission and God knows how many are there in the various Prime Minister’s advisory councils. No one has a latest count of these busybodies. At least one expert or an observer of the New Delhi bureaucracy has come out with some cogent reasons why the Planning Commission, as an example, is an anomaly right now! First, there is the current mood of disenchantment. Our economy, whatever the PM or his obliging advisers might claim to see or say, the economy is now scam-filled, it is now clear that there is vast corruption at the highest levels of the government. There is black money hoarded abroad. Now, what is news is that it is not the usual suspects, the underworld or the corrupt businessmen who would always break the law of the land and take the money abroad to put in Swiss banks or tax havens, it is the new class of politicians and bureaucrats who are the new practitioners of this art of taking bribes and transferring and hoarding abroad, who are now beyond the reach of the law and to put it differently, the new governance deficit which was pointed out by the new class of left-over good corporate leaders. But then what is the chance of a response? There is a case for new thinking for decentralised planning process. Let us activate the panchayats to monitor the 100-days work scheme. Or better abolish the scheme or merge with the agriculture development schemes. Otherwise, the welfare of rural labour, or landless labour in small and medium industries need many protection, social benefits, education and medical benefit. Let the government give up the grand talk of economic reforms. The economic reforms is now driven by FDI and the big corporate initiatives. So, regulate and make the corporate venture adhere to law. Strengthen the governance culture. Choose the right persons for big ministerial assignment. The Prime Minister must strict to high standards. The PM must be seen as speaking the truth, taking Parliament into confidence.PM must interact with the common mass of people as often as possible. The current practice cost his credibility dearly. Let us hope he decides to function differently or make way for others. There is no inner -correction mechanism, there is no inner resilience in the political system. That is the current tragedy. It is now plain that there is internally huge diversion of funds for the 100-days work scheme, grandly called by some strange name associated with the Mahatma Gandhi. Please let us drop Gandhi from this scheme. It is hugely misused and the states are becoming bolder and the Centre’s writ doesn’t run in these states. In TN, the ally DMK did the maximum damage. Two ministers, one in National Highways and another in the Telecom, did what others dared not to! Notorious corruption came to engulf the UPA_II and even after removing the two ministers, one by force and another by 2-G scam getting into the net of the Supreme Court. But then the development got hurt. National Highways is yet to recover its original momentum and telecom, one can’t be sure of when the whole mess will be sorted out. The Prime Minister and his officials are rhetorically focused on economic reforms. Now, even the phrase economic reforms sounds a joke, if not worse still. What economic reforms in a state of oligarchical growth of favourites among the corporate honchos. The Cairn-ONGC dispute on royalties, there are disputes about the royalties and the FDI in oil and gas, the ONGC would pay 100% royalty while it would hold only 30 per cent of the share holding. The government is yet to clarify the issues here. This is not yet done and when it will be cleared up? Who is the minister in charge? What he is thinking and what are his thoughts? There is no more any need for silence on this score. The public must know about the government’s thinking. Unfortunately, our MPs are not what their predecessors used to be. Knowledgeable MPs seem to be in short supply. It is for the Sonia Gandhi and PM duo to answer this question. Yes, we can’t just talk in compartments. One issue and that leads you to the government and another lead takes you right into the 10 Jan Path conclave where very different set of operators with different mindset are perched as advisers and states-in charges! As for winding up the Planning Commission it was set up by an executive order. It continues to exist. That is all. Under the Constitution public expenditure is scrutinised and approved by Planning Commission. Fund flows to the states takes place through Finance Commission, PC and Central sector and Centrally-sponsored schemes (css).Let us strengthen and revive the original Constitutional body. The issue needs in-depth study and one obvious case is the misuse and misutilised funds under the various Central sector schemes. No one knows the number of css! Once it was 455 and now pruned to 150.Not sure even now! There is no clarity about Plan and Non-plan schemes! India still is a country of small scale enterprises and the bulk of the labour is unorganised and lacking all social protection . 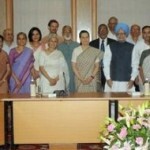 It is this class of labour, hard-working and yet lacking in social benefits, the Sonia Gandhi led National Advisory Council must give priority. Not the fashionable labels or other such wild schemes that might drain resources but lacking in sustainability. 11% of world carpets produced here. 41% of labour migrates to distant states for jobs. One billion rail tickets are sold every year. Add the ticketless travel! This under-class contribute 43% to our exports. Tiny non-agricultural enterprises employing less than 10 workers have increased by 110%in the last two decades. In the organised sector 46% of the workforce belongs to the informal sector. That is why formal employment figures remain rather constant, at 24 million, while the production in the organised sector has risen, it is because of the ragtag labouring class that has risen in numbers and hence the growth in production. India still is a country of small scale enterprises and the bulk of the labour is unorganised and lacking all social protection . 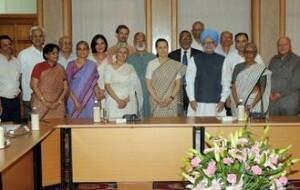 It is this class of labour, hard-working and yet lacking in social benefits, the Sonia Gandhi led National Advisory Council must give priority. One billion rail tickets are sold every year. Add the ticketless travel! This under-class contribute 43% to our exports. Tiny non-agricultural enterprises employing less than 10 workers have increased by 110%in the last two decades. In the organised sector 46% of the workforce belongs to the informal sector. That is why formal employment figures remain rather constant, at 24 million, while the production in the organised sector has risen ,it is because of the ragtag labouring class that has risen in numbers and hence the growth in production. PC has failed to decentralise the planning process. It is now the reverse. For every small thing, we, both the state agencies and individuals travel to New Delhi and pay small and big bribes to get things done! It is noted by one critic that most of the PC documents are rehashes of First Five Year Plan documents! Much more damaging is to note that the Planning Commission members retired bureaucrats or failed politicians and as the current practice of nomination culture, you can get a nomination if you hang around, nomination for NAC, for PC or Rajya Sabha are all through a crony culture! Wiki Leaks has done a great national service by highlighting the weak governance mechanism at many levels of the government and the party. Let us not forget what Rajiv Gandhi said of the PC, a bunch of jokers! How unkind, one may wonder. But now, considering the number of scams and scandals, what one to understand the reasons could be? Tamil Nadu and West Bengal are cited as typical states with reportedly 2lakh crores and 2.5 lakh crores debt. In TN it is wreckless populism and in W.Bengal no less. In W.Bengal you have an insatiable supply of cheap labour that travels all over India for jobs. In TN too there is migration of cheap labour for construction industry and the state continue to remain poor, despite its otherwise claims of development. The point is that NAC which came out with the 100 days wage labour is now bedeviled by large scale corruption and diversion of funds. We need a revamp and a new way of fixing responsibility to implement the scheme. There is also a clamour for scrapping the very NAC itself, whose members randomly and even whimsically selected and they come out with all sorts of wild schemes like the “free food for all” and other such highly populistic schemes that had already been shot down by the PM’s economic advisory council! What sort of work for these councils in rivalry? Now, as for one more white elephant which the PM knows and yet he keeps mum and the whole non-work is funded. That is none other than the Planning Commission itself. Planning Commission, it is also pointed out, is not in the Constitution. There are so many constitutionally -mandated bodies and yet the Planning Commission that gathered much glamour in Nehru’s days and it retains its existence on that faded glamour. I am a Mumbai based entrperenur looking for opportunities in the agricultural sector. We are looking at an end to end solution in acquiring land, developing farm house alongwith actual cultivation of crops as per customer requirement. Do you feel a project like this feasible and also is there an opportunity for something like this on outskirts of Mumbai? Look forward to your reply. I want to calirfy that this is not real estate play we are targetiing but more of agriculture and farming for people who are busy but would like to pursue this.